Great audio and layout, the ski goggle band helps the headset from sagging too much. LEDS, retractable mic, LEDS, good sounding, LEDS, good mic. Oh and did I mention RGB LEDS? 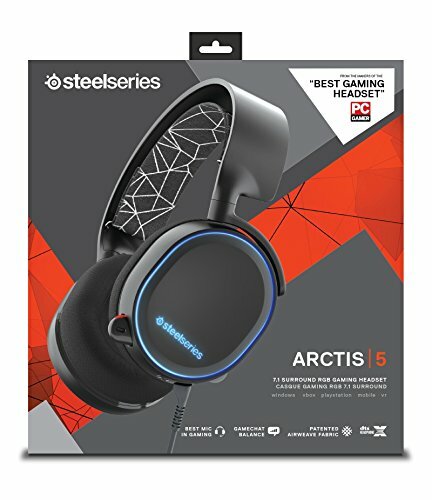 The Steelseries Arctis 5 is an amazing wired headset. My play group noticed the improved sound quality coming from my mic within seconds of our first game after I bought it. The sound quality in the headset is very good, but the preset EQs in the software are wonky. I run the headset with the default EQ and I have no complaints. 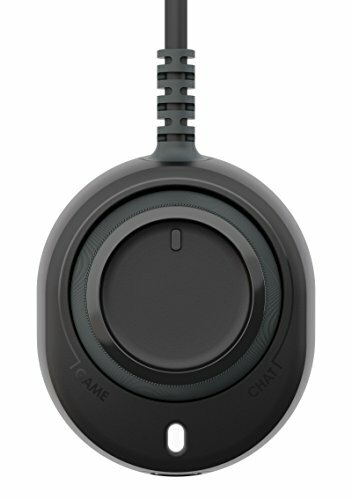 Very comfortable to wear for long play sessions, and the retractable mic allows me to get it away from my face when I am just using the headphones. 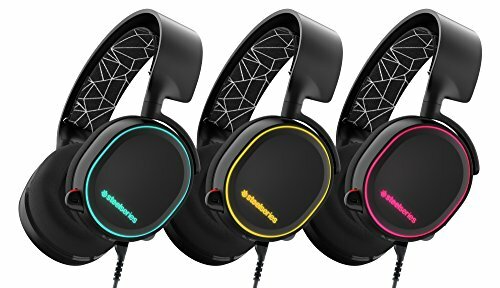 Got them at an amazing deal and they are so comfortable and have really cool lighting features. The sound quality of the mic and headphones are great also. Good sound out of these guys, They fit very comfortably as well. Only downside is I cannot get the chat/game volume dongle to properly work (either turn down chat and up game volume or vice versa.. it just turns both down or up) other than that its a great set of headphones for the price. My last set of turtle beaches gave me the worst headache when I wore them. ** correction.. You must use 2 different programs in order for you to use the dongle. ie. playing Dota 2, while using Discord as your chat platform will allow you to turn down either chat or game volume individually. I probably overpaid for these but they are great. 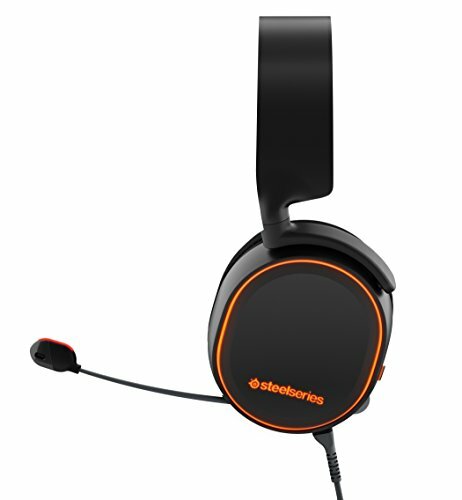 The retractable mic is very nice, I am always using the volume control on the headset, and it's comfortable with glasses. I've had this thing for a year, sound is amazing, comfy on my head and ears over long durations. I occasionally disconnect it and use the audio adapter cable to plug it into my phone for lengthy conference calls. This product is why I opted for the SteelSeries mouse and keyboard. Most slept-on headset of 2018. More than happy with my purchase. Software lets you choose the sound, not he manufacturer. RGB is an added bonus for those of you nerds. This is my first time having surround sound and i have to say it's quite amazing. The sheer clarity of the mic and drivers is awesome too. Crystal clear sound. I honestly forget that I am wearing them, they are so incredibly comfortable. The RGB is also a nice touch.